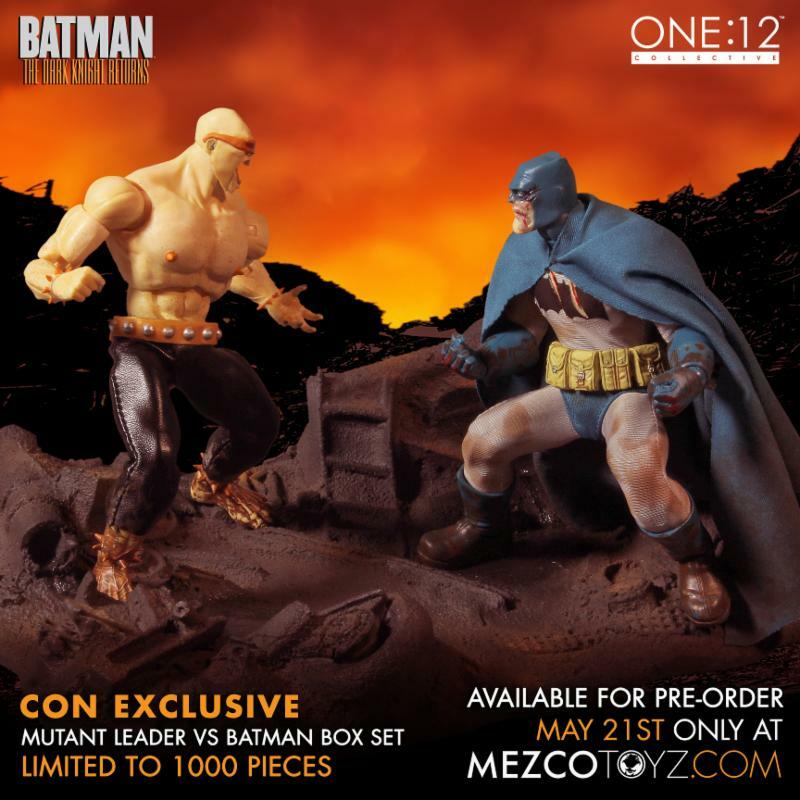 Depicting the epic first encounter between Batman and The Mutant Leader in one of comicdom's most infamous battles this boxed set includes both a battle damaged exclusive Batman, an exclusive deco variant Mutant Leader and a polystone display base of the Gotham City Junk Yard which became the battle field for these two titans. - Battle Damaged Batman figure with an exclusive head sculpt, torn exclusive variant costume, alternate hands and exclusive "Knock-Out Foam" accessory designed to fit over his enemy's face. - Exclusive "first look" Mutant Leader with a variant dirtied up paint application to enhance the realistic battle in the junk yard, alternate hands and crowbar accessory. - A Polystone cold casted display base of the Gotham City Junk Yard over 10 inches long with felt footing. - Packed in a large closed box with a specially die-cut slip cover and utilizing the One:12 Collective's collector friendly no twist tie packing method for easy in and out of box displaying. Each figure is built on a One:12 crafted body featuring over 30 points of articulation with specially tailored cloth costuming, intricate hand painted decoration and state of the art solid construction. Pre-Order available 5/21/2015 and for sale at the Mezco booth at San Diego Comic Con while supplies last.